Fun and Whimsical all included! 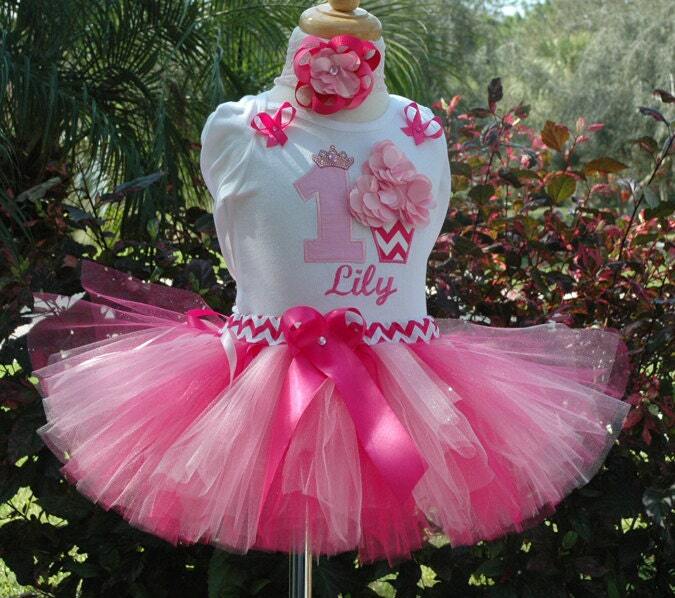 This gorgeous baby girl tutu outfit has all the details included so everyone will remember your Princess's 1st Birthday Party!Available in 1-10 Birthday Year.Perfect your baby's Cupcake Smash Cake Birthday Theme. If you have been so busy with your little one and time just got away from you we have ******Rush orders available! ********Please message us with the date you will needed by. Thank you. This set will be made with pink chevron fabric for the cupcake and sparkly pink fabric on the number one. A gorgeous pink and bling tiara on the top of the 1. The onesie or shirt will be personalized it is very important you leave me her name at checkout in the notes section. Tutu was created with hot pink and soft pink tulle, features strands of ribbons around it. Hand and Sewn not braided . The shirt has a chevron cupcake with 3 soft pink flowers and a pink number one with a jewel crown on top it also has a small pink bow with a small pink rhinestone on each sleeve. The hair bow features same flower as the cupcake with a pink rhinestone in the middle and will be sewn onto a soft elastic band. Fast shipping and perfect size!! Love it! !